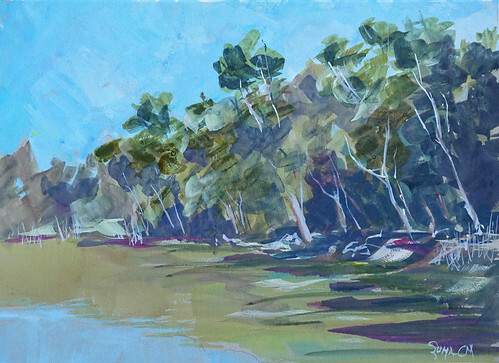 Glad that a fellow artist has resurrected the long-neglected South Bay Plein Air Meetup group. Yesterday there were three of us at Vasona Lake County Park in Los Gatos. Since I was squeezing this session in between errands and appointments, I chose to do a quick painting in gouache on Canson Mi-Teintes Touch toned paper. The sun was hot and climbing, so the paint dried almost instantly. The whole thing took less than an hour from setup to signature.